Dare, Tessa. Goddess of the Hunt. (New York: Ballantine, 2009). ISBN – 9780345506863. Ever the bold adventuress, Lucy Waltham has decided to go hunting for a husband. But first she needs some target practice. So she turns to her brother’s best friend, Jeremy Trescott, the Earl of Kendall, to hone her seductive wiles on him before setting her sights on another man. But her practice kisses spark a smoldering passion – one that could send all of her plans up in smoke. Jeremy has an influential title, a vast fortune, and a painful past full of long-buried secrets. He keeps a safe distance from his own emotions, but to distract Lucy from her reckless scheming he must give his passions free rein. Their sensual battle of wills is as maddening as it is delicious, but the longer he succeeds in managing the headstrong temptress, the closer Jeremy comes to losing control. When scandal breaks, can he bring himself to abandon Lucy to her ruin? Or will he risk his heart, and claim her for his own? 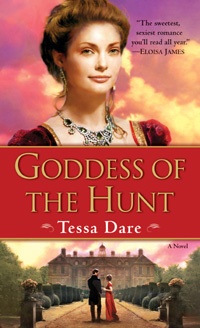 I feel the need to admit that I have seen Tessa Dare’s name (and her books) all over the place for the past six months – and have consciously chosen to stay away from her books. I think that I was a bit turned off by the covers. I can’t really say why, but I have to guess that I assumed from the cover that this would not be the type of romance novel in which I would be interested. Maybe I thought it would be less about the romance between the hero and the heroine and more about just the heroine. After having read the book, I am definitely at a loss to explain my reaction to the covers of this and the next two books in the series. Last week, I actually read the blurb for the book and realized that the plot revolved around a woman and her brother’s best friend – one of my favorite romance plots. Since, I was placing an order for some books, I included this. My reaction? Wow, wow and wow!! I can’t believe that I allowed myself to wait so long to read this book. I SO adored it. Lucy is enchanting and was from the moment that she barged into Jeremy’s bedroom for a practice kiss (which was on page 1). She is such a wonderful character, full of spirit and life with a deep core of vulnerability. Jeremy, the hero, certainly was not absent from the story, as I had once assumed from the cover art. He is a man who is blindsided by the effervescent Lucy and the feelings that she inspires by asking to practice seduction with him. Lucy tells Jeremy that she is practicing to seduce another of her brother’s friends, Toby – whom she has loved for years and years. Toby is about to propose marriage to someone else, and Lucy is determined to stop the match and win Toby’s love for herself. Jeremy knows that Toby does not love Lucy and begins a campaign to keep Lucy from doing something foolish like ruining herself. Jeremy, of course, is developing feelings for Lucy – ones to which he does not want to admit. I loved the scene in Henry’s office where Lucy and Jeremy are discussing Toby and his relationship to Sophia. Big sighs! This was one of the most romantic scenes, full of emotion – of which there is plenty in this book. Both Jeremy and Lucy are very intense characters who find themselves falling in love with each other rather unexpectedly. One of the biggest surprises for me is the friendship that develops between Lucy and Sophia, the rival for Toby’s affections. Lucy wants to hate Sophia, and Sophia seems to be a bit envious of Lucy. Yet, they become quite close. I laughed out loud when the two got rather tipsy and wrote the letter to Sophia’s imaginary lover, Gervais. It was rather ironic that this letter came to play such an important role in Lucy and Jeremy’s courtship. I’m still laughing about the rabbit and cabbage endearments. I also loved that Lucy gave her book (which was teaching her about seduction) to Lucy. I so hope it plays a part in the second book. This book is definitely destined for my keeper shelf. I have already read several passages several times – and envision re-reading the entire book several times in the future. Final Thought: I am so glad that I finally bought this book. It is excellent, and I can’t wait to get the next two books in this series.